School’s out for the summer, and there’s plenty going on over the next six weeks to keep little ones entertained. 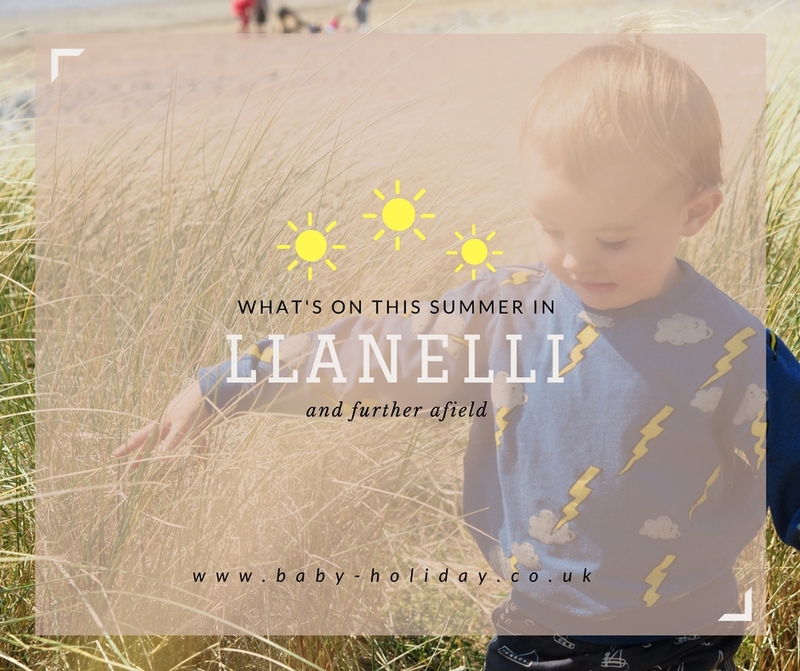 Here’s a guide of what’s on in Llanelli, Carmarthenshire, and further afield, from stage shows and theatre workshops, to traditional family fun days. The listings are broken down into categories – outdoor fun, theatre and film, regular events for the ongoing activities over the holidays, and further afield if you fancy a day out. If I’ve missed anything, please let me know by tweeting me @alanababyhols or on the Baby Holiday Facebook page and I’ll add it in. If you’re on Instagram, give us a follow and see what we get up to over the summer. Saturday, July 22, 1pm-5pm, Burry Port Harbour. Meet the crew and see their life-saving equipment at a family-friendly open day. Crews will race their home-made rafts in the harbour in aid of Burry Port RNLI and Afia Banjul Children’s Football Academy. Awards will include best dressed raft, last raft over the line, and first to sink. As well as 7 races, there will be interactive circus workshops, face painting, garden games, table tennis and activity packs. Activities are free after entry. Parking is free, and a race day bus return service will run from Llanelli train service on a first come, first served basis. Get a closer look at these elusive mammals in their natural habitat. Meet the badger expert at the Visitor Centre carpark at about 6:45pm to walk to the badger hide. Sturdy shoes are advised and booking is essential. Drop in anytime between 11am – 12pm, or for the full hour, on the first Sunday of the month. Suitable for all ages, especially primary school age and will include a variety of outdoor activities including; planting and maintaining plants and crops, growing and harvesting fruit and veg, making things for a wildlife friendly garden and other wildlife activities. Included in admission price. Fun and games for all the family at Parc Howard. Hanes Cedweli’s fifth annual Mediaeval Ffair Cedweli will be held within the walls of the castle. There will be live music from local musicians, re-enactors and the mediaeval camp, and minstrels strolling around. Everyone can try their hand at archery; children can have a go at learning circus skills and see the apothecary’s potions. Adults can see what the future holds and get their cards read and fortune told, or browse the craft stalls. There will be prizes for best costumes and a raffle. Free entry for local residents with a pass or usual CADW fees apply. All children under 5 receive free entry. Shapeshifters Magical Birds sessions with the Crowman will allow little ones’ imaginations to run wild. Get involved and enjoy the creative process with your children. Saturday, August 12. Gates open at 7.30pm, film starts at 9.30pm. An adaptation of the Disney classic with widened mythology. Join Badger, Ratty, Mole and Toad for a perfect summer of adventure. This musical family show is presented in beautiful traditional costume and features a woodland parade during the interval for everyone to join in with. Adult £15 / Child £10 / Family (2 Adults & 2 Children) £44. Take your own rugs or low-backed seating. Live Superstars of Wrestling return to Ffwrnes. Experience the excitement and atmosphere first hand as top names in British wrestling battle it out in an evening of high impact wrestling action, suitable for all the family. Ffatri Film Ffwrnes is offering a two day Welsh-language workshop to develop film making skills including camera work, sound design, editing and acting. Enjoy the original film about Willy Wonka and the five families who tour through his wacky and wonderful chocolate factory. legacy. Saturdays July 22 and 29, and 5, 12, 19 and 26 August. Depart Bronwydd Station at 6pm and 7pm. Arrive 15 minutes before departure. Take a ride on a heritage railcar and enjoy a fish and chips supper. Real ales are also available. You can enjoy the hay bale maze, give water zorbing a go, or play endlessly in the adventure park. Hawk Adventures will offer abseiling on Tuesdays and tree climbing on Wednesdays. The butterfly house and glasshouse will also be open every day. Take part in a watery treasure trail and spot the wildlife on a one kilometre canoe safari through the wetlands (suitable for children over five). Or hire some bikes to explore the grounds. Adult and children’s bikes – including some with stabilisers, and a small number of trailers – are available to hire for free. Canoe safari and bike trail open daily from noon – 4.30pm, with no additional cost after entry. Monday, July 24 – Thursday, July 27. Showground, Llanelwydd. The biggest agricultural show of the year, with four days of livestock competitions, displays, shopping and food and drink. Entertainment is lined up for 12 hours each day, with something for all ages to enjoy. Friday, July 28 to Sunday, September 3, 10am-8pm. Cardiff will once again create its own seafront at the Bay, with sand, a fun fair and entertainment. Entry is free. For a full guide of Cardiff events, head over to Cathryn at Cardiff Mummy Says, who has it all rounded-up! Pups Chase and Marshall will visit from Adventure Bay throughout the two days. This is not a meet and greet event. Included in entry price. *Please confirm events with the organiser prior to attending. I can’t be held responsible for changes of date, time, or cancellations.